Visitors walking down the alleys which run from Barton Street to the Swilgate may sometimes pause to wonder how they came by their names. One such alley is Compton's, by the side of 'The Wool Basket', the shop which now occupies 77, Barton Street. It takes its name from the family who ran a cabinet making business here for more than a century. In the spring of 1995, Mrs. Margaret Gater, the proprietor of 'The Wool Basket', discovered three ledgers in the attic. Although old, they were in remarkably good condition, with pages whole and untorn and ink scarcely faded. The two largest were the order books of Theophilus Compton, the last of his family to run a cabinet making and furnishing business on the premises. There had long been Comptons in Tewkesbury; in the Record Office there is the seventeenth century will of William Compton, who may have been a forebear. 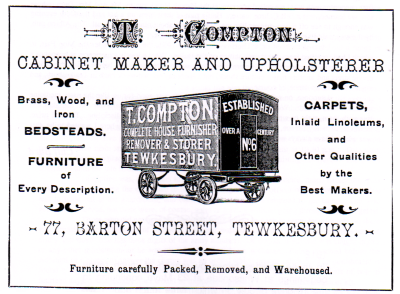 The first Compton connected with the furniture business, however, was Richard, who appeared in Bradshaw's 1820 Directory of Gloucestershire, when he gave his trade as book keeper. In Robson's 1839 Directory, however, he called himself a cabinet maker. In the early 1900's Theophilus Compton claimed that the business had been established for more than a century, so Richard may have started cabinet making some time earlier, Successive members of the family ran the business for the rest of the century. Slater's Directory of 1868 includes 'Compton Brothers, cabinet makers and upholsterers'; in Kelly's Directory of 1870 the brothers are shown as 'William and Theophilus Compton, furniture brokers'. Kelly's 1879 Directory is more expansive, calling the brothers 'cabinet makers, upholsterers, house furnishers, carpet factors and undertakers'. However, at the 1881 Census, William Compton, who lived at Oldbury House, Cotteswold Road, gave his occupation as 'hosier', and in Kelly's 1885 Directory his name has disappeared; the firm is now listed as simply 'Compton, T'. The 1897 Kelly's Directory also mentions only Theophilus Compton, and so it remained until the firm's name disappeared from the directones. The first ledger opens in 1874, when Theophilus Compton was 42. (There is some uncertainty about his age, for although he gave his age as 49 in 1881, he confessed to 62 years in 1891!) Theophilus lived at 77, Barton Street all his life; in 1881 his daughter Annie, aged 20, and his son, also Theophilus, 15, were living with him and his wife Maria. By 1891 both children had left home. 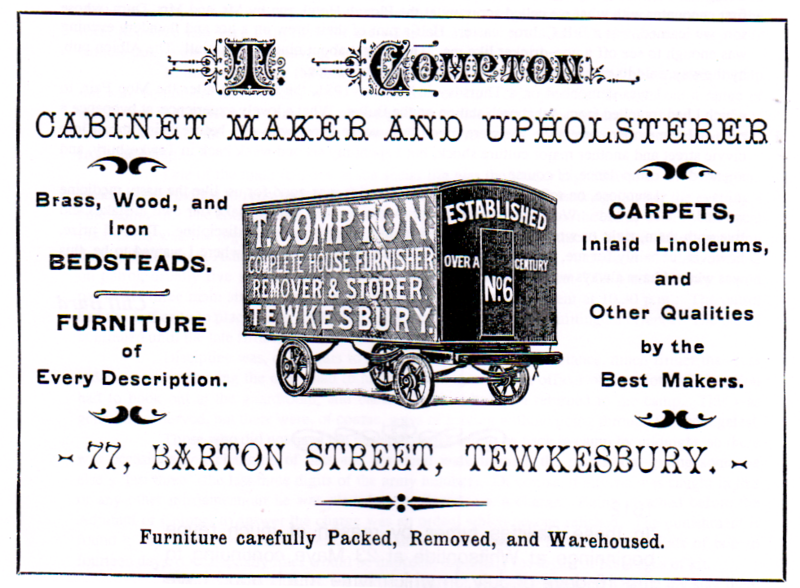 Theophilus Compton was a busy man, making furniture and coffins as well as selling factory-produced items. The largest order noted in the ledger totalled £204 3s 0d (£204.15p), when a Mr. Hemingway furnished a house in High Street, but most orders were much smaller, for no more than a few pounds or shillings. 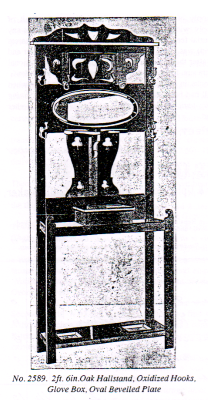 In the late nineteenth century a 'decorated ash bedroom suite of furniture consisting of chest of drawers, pedestal toilet table with glass, marble top washstand, chamber pedestal, three chairs and napkin rail' could be bought for £34, while a three-foot chest of drawers, of a quality suitable for a servant's room, cost £l 7s 6d (£1 37½p). A common purchase was a 'French iron bedstead', at £1.10.0 (£1.50). Carpets and rugs, and, towards the end of the century linoleum, were also sold. Theophilus Compton was willing to turn his hand to almost anything, for he repaired blinds, castors, stable stalls, roofs, conservatories and greenhouses, as well as remaking and 'purifying' mattresses and reupholstering all types of furniture. For the Rural Hospital he often fumigated mattresses and palliasses, doing the same for customers with feather mattresses, adding extra feathers when necessary. By the end of the century sprung mattresses were coming into favour, though there were still customers for those made of wool or hair. William Cole, the only worker mentioned by name in the first ledger, undertook many jobs away from the shop, though Theophilus himself occasionally helped. Cole was succeeded by Teal, whose Christian name is not given, in the early 1900's. The charge for their work was four shillings (20p) per man for an eight-hour day, a rate of sixpence (2½p) per hour. Occasionally there were special orders; making to measure leather covered cushions for a horse trap; two cushions for Mr. Moore, the solicitor, for use in his houseboat. On January 10th.,1878 a Mr. Long, of Walton Cardiff, bought a pair of crutches, returning two days later for a second pair. They cost 7/6 (75p) a pair. Sadly, the following month Mrs. Long paid £l.15.0 (£1.75) for a hospital mattress, presumably for her husband. One remarkable order was given by a Mr. Guilding of Bushley, who in November 1875 asked for new hoses for a washing machine. 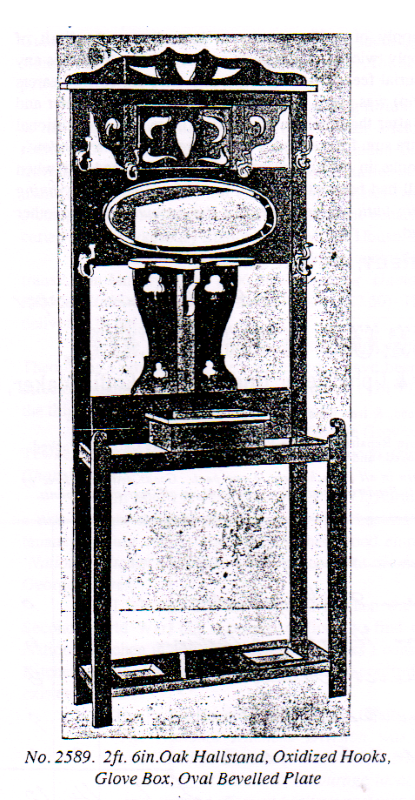 Theophilus Compton made them at a charge of £1.3.0 (£1.15). Washing machines did not come into general domestic use until the First World War, so Mr. Guilding was in advance of his time. The business was also employed by the Corporation and other official bodies. In 1887 Theophilus charged the Board of Health £l.10.0 (£l.50) for making a Vball post 8 feet long 6!' X 6" with inch elm top for lifebuoy at Sandy Point'; in 1874 he had charged Tewkesbury Corporation 5/6 (27½p) for 'new gate posts for rails on Mythe Road' and 4/6 (42½p) for fixing them. In 1874 the Town Council paid two guineas (2.10) for a folding screen covered with crimson baize, and seven shillings (35p) for two cushions for wicker chairs. 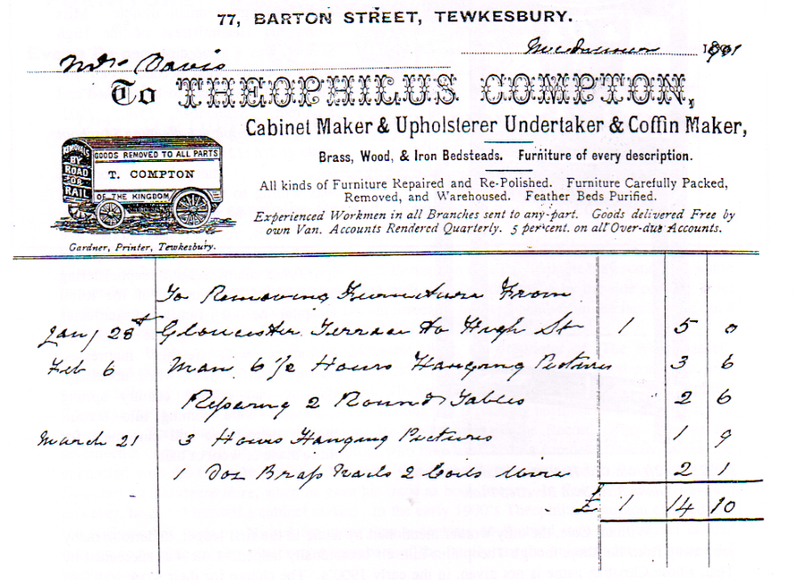 The Healing family were good customers, too, buying their furniture and often using Theophilus Compton to do alterations and repairs. 'October 10th.,1875. Mr. W. Healing. Making an oak case for bats & fishing tackle. £2.10.os (£2.50) 'Mr. Alfred Healing. December 11th.,1875. Hire of carpets, curtains & 5 dozen chairs at Town Hall £1.0.0. 3 men 3 days each preparing room, fixing carpets, curtains &c. £1.7.0.' (£1.35). It was quite common to hire furniture and carpets for functions at the Town Hall. Of course, undertaking produced steady trade. An elm coffin, lined and trimmed, cost £l.15s.0d. (£1.75), while the most expensive, an oak coffin, with brass furnishings and the name engraved, cost £8.10s.0d. (£8.50). The supply of coffins seems to have been the limit of Theophilus's involvement with funerals, for only twice in all the years covered by the ledgers is any further service mentioned; once there were burial fees of 6/6d (32½p), and once six coffin bearers were paid 2/6 (12½p) each, while 10/6d (52½p) was given to the sexton for the use of the bier and the tolling of the bell. On another occasion, after the purchase of a coffin, there was an additional charge for alterations to a window, with an extra sum for 'removing the corpse through the window'. These ledgers are clearly the books in which orders were noted, crossed out when completed and sometimes ticked when the bill had been paid. Once, in 1876, a 'mahogany dining table & a black pony' were held 'as security until the settlement of the account', but no other difficulties in obtaining payment were recorded. The handwriting is remarkably clear, a fine script which only occasionaHy deteriorates. Customers were usually identified by trade or profession, with perhaps a note of the street where they lived; only when they came from out of town, or were gentlefolk who had no need to work, was a fuller address given, and even then it was sketchy. Titles were meticulously recorded. Thus we see 'Mr. Moody, painter' Mr. Wm. Allen grocer, Captain Brough, Bredon, Colonel Cormack, Wm. Dowdeswell, Esq., Rev Livingstone, Forthampton, Dr. Allard, Mn Jordan, Veterinary Surgeon, Mr. FL,Brown, solicitor, the Earl of Yarmouth'. Customers came from a wide area including Cheltenham, Gloucester, Stroud and Worcester, as well as villages nearer Tewkesbury. Theophilus Compton clearly enjoyed a good reputation. By the turn of the century, Theophilus Compton had at least two vans, one large and one small. He may have had several more, for the illustration to his advertisement in the 1903 Gardner's Guide shows van number 6. He had horses, stabling and coach-houses, as well as workshops and storage for his timber. There was a depository, for he stored furniture, usually charging 3/6 (17&frac12;p) per week. The vans were kept busy, carrying furniture and goods around Tewkesbury, often going to the station, but at times taking loads further afield, to Worcester, Malvern or Gloucester. The removal of goods to places as distant as London or Liverpool was arranged, with an employee travelling on the train to supervise the safe transfer of the goods at their destination. The vans were used for other purposes, too, once taking inmates from the Union to the Mythe, presumably for a picnic, as tables and a tea urn were hired for the occasion. In January 1905 eight loads of stone were carted from Tewkesbury Station to the Mythe House, at a charge of six pounds. Theophilus made several claims against the Midland Railway for damage to goods in transit. On January 10th., 1906 he claimed for 'Damaged tricycle 8/6 (42&frac12;p). Hire of tricycle from October 20th. to December 29th. £2.10.0.' (£2.50) He may have used the tricycle for some of his deliveries in the town. The last entry in the ledger, which is not full, is for March 26th., 1908. Whether Theophilus Compton had died or retired, I have been unable to discover, but no subsequent trade directory mentions the firm. In any event, by 1914 77, Barton Street had passed into other hands, as the third ledger found by Mrs. Gater shows. In May 1914 George Groves let 77, Barton Street to Richard Harwood, a cycle agent, at a rent of eight shillings (40p) a week. The business did not thrive, and Mr. Harwood ended the tenancy in July 1916. The building then stood empty until March 1918, when it was let to the 'National Kitchen Committee' at a reduced rent of one pound a month, a patriotic gesture typical of George Groves. d. Economy of labour by collective preparation of food. Thus 77, Barton Street was left without a tenant until September 1919, when Mr. W.C.Spencer rented the building. He is not shown in the trade directories, so he may have used the building solely as his home. He did not stay long, relinquishing the tenancy in September 1921. A Miss Launder immediately took the building, and opened a shop selling children's clothes. She stayed in business there until December 1934. Mr. A.H.Parsons Kloer selected the shop in Barton Street as a suitable site to open his new business, Chapman & Co..12 He came to Tewkesbury with his wife and two young children from Pontypool, where he had managed a furniture shop. Mrs. Kloer had not seen the building before, and her daughter, Mrs. Joan Hawkes, who still lives in Tewkesbury, recalls that her mother was appalled at her first sight of her new home. Although Miss Launder had paid rent until December 25th.,1934, she must have left the building some time before, for it was dirty and neglected. The kitchen in particular horrified Mrs. Kloer, who demanded that it should be partitioned to provide her with a smaller room. The rest of the building was similarly neglected. Unfortunately, Mr. Kloer did not enjoy good health and died in 1940. Mrs. Kloer ran the business until the end of the war. George Groves had died shortly before the start of the war, and his widow sold 77, Barton Street to a Mr. Attwood in 1940. At the end of the war Mr. Attwood took over the business and ran it for some years before handing over to his son. The business subsequently moved to various premises in High Street, until it closed a few years ago. 77, Barton Street is now the home of a successful business. Let us hope that it will thrive as long as Theophilus Compton’s! The Compton and Groves ledgers are now in the care of the Town Museum. The respected family of Compton has lived in the house next to the street for the past 100 years if not longer. At the beginning of the present century it was a very old-fashioned house. it was rebuilt and a modern fronted house made of it. The Compton family is an ancient Tewkesbury family and have always been a credit to the town as honest and upright tradesmen. Their descendants are following the example of their forebears. Long may they live and prosper. There are two sons and some grandsons living, holding high and first class shuafions. Reproduced by kind permission from ‘A Short History of the old Alleys, Courts and Lanes of the Borough of Tewkesbury’ by John Rogers, published by Collections, 5 Barton Street, Tewkesbury. Richard Compton; Male; 60; Carpenter; Born In Gloucestershire. Jane Compton; Female; 50; Born In Gloucestershire. William Compton; Male; 20; Carpenter; Born In Gloucestershire. John Compton; Male; 18; Born In Gloucestershire. Theophilus Compton; Male; 14; Born In Gloucestershire. Samuel Compton; Male; 12; Born In Gloucestershire. Richard Compton; Head; Married; Male; 70; Joiner Employing 2 Men; Born Hanley Worcs. Jane Compton; Wife; Married; Female; 59; Joiners Wife; Born Tewkesbury Glos. Robert Compton; Son; Married; Male; 34; Grocer; Born Tewkesbury Glos. Ann Compton; Daughter-in-law; Married; Female; 31; Grocers Wife; Born Fladbury Worcs. William Compton; Son; Single; Male; 32; Cabinet Maker; Born Tewkesbury Glos. Theophilus Compton; Son; Single; Male; 21; Cabinet Maker; Born Tewkesbury Glos. Theophilus Compton; Head; Married; Male; 43; Upholsterer; Born Tewkesbury Glos. Maria Compton; Wife; Married; Female; 43; Born Pendock Worcs. Annie Compton; Daughter; Single; Female; 14; Born Berrow Worcs. Theophilus C. Compton; Son; Male; 5; Scholar; Born Tewkesbury Glos. Theophilus Compton; Head; Married; Male; 49; Upholsterer; Born Tewkesbury Glos. Maria Compton; Wife; Married; Female; 48; Born Berrow Worcs. Annie Compton; Daughter; Single; Female; 20; Born Berrow Worcs. Theophilus C. Compton; Son; Male; 15; Born Tewkesbury Glos. Caroline Dowding; Visitor; Single; Female; 17; Farmers Daughter; Born Castlemorton Worcs. 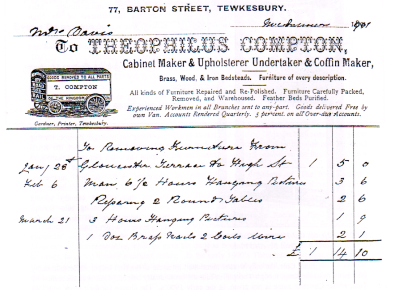 Theophilus Compton; Head; Married; Male; 62; Upholsterer;b. Tewkesbury Glos; Employer. Marie Compton; Wife; Married; Female; 61;b. Pendock Worcs. Clara Slatter; Servant; Single; Female; 14; Domestic Servant;b. Fiddington Glos.